Here are some lessons we can draw from the best and most creative recruitment advertising, which you can use to improve your own recruiting in 2015. All of the below are from the Creative Excellence Awards, an award program (I was one of the judges) to recognize outstanding achievement in recruitment advertising and marketing. Dutch bank ABN AMRO launched an internal campaign that encouraged employees to “Be Outspoken” and which used the tagline “Do Tell.” To reinforce this concept, one morning the company had employees met be a photographer and an interview at the front door, and were asked about their “secret” talents. The photos were immediately added to a digital display for the next arriving employees to see. ABN AMBRO’s video shows the workers flattered and smiling as they talked about their strengths, hobbies, and passions. The result was a top-three finish for the CEA’s Best Multimedia Campaign. Another Dutch company, KPN, created a recruitment campaign that made candidates, not employees, feel incredibly special. 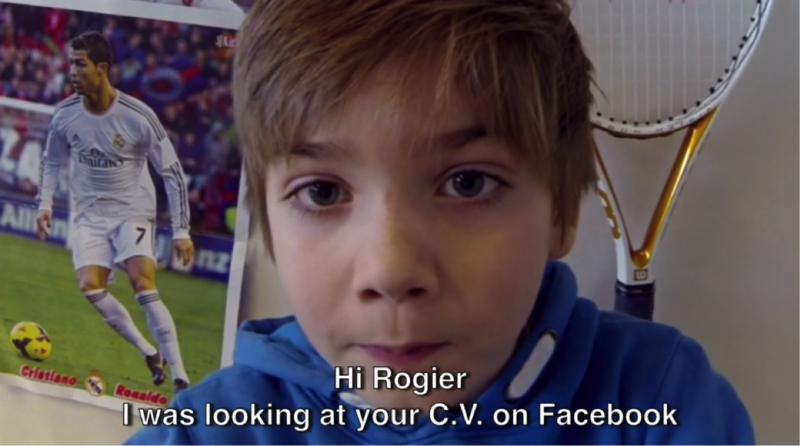 The wireless carrier “sifted through” job candidates’ social media profiles and produced personal videos starring children, who challenged candidates to help create technology for the next generation. The kids also referred to hobbies, travels, and volunteer work of their subjects, making little jokes along the way. The call to action was to enroll in KPN’s famous Business Course. I’ve never seen anything quite like this. I’ve long crusaded against the dull “refer a friend and get a Starbucks gift card” method of employee referral programs. UPS (a frequent star) and APAC Customer Services have taken the ERP to new and exciting places. 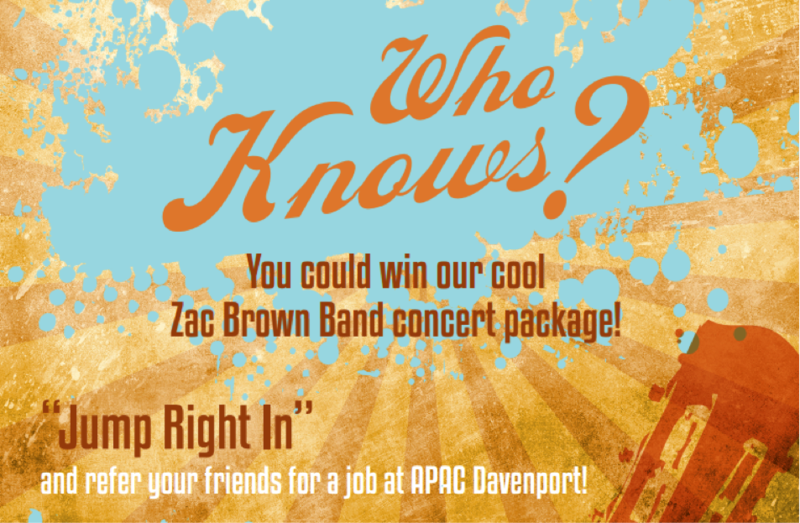 The winners of the APAC referral program received two tickets to a Zac Brown Band concert, so the company tailored all its materials to song titles and lyrics from the band. The messaging was eerily perfect: “Jump Right In,” “You Get What You Give,” “Who Knows.” Instruments and microphones formed the designed of all the flyers and posters. It was a very clever way to unify the ERP and to make it relevant to employees, as the concert date became a kind of countdown that increased the urgency and excitement. UPS created a “Lighten the Load” referral program for its peak season. The suite of materials included a special, responsive website where employees could learn more about the program and register for prizes. Or employees could enroll in the program via SMS, which I love. UPS provided workers with “handshake cards” so they could easily refer anyone they met at any time. It was a very robust and employee-friendly program, which took first place in the CEA Referral Program category. 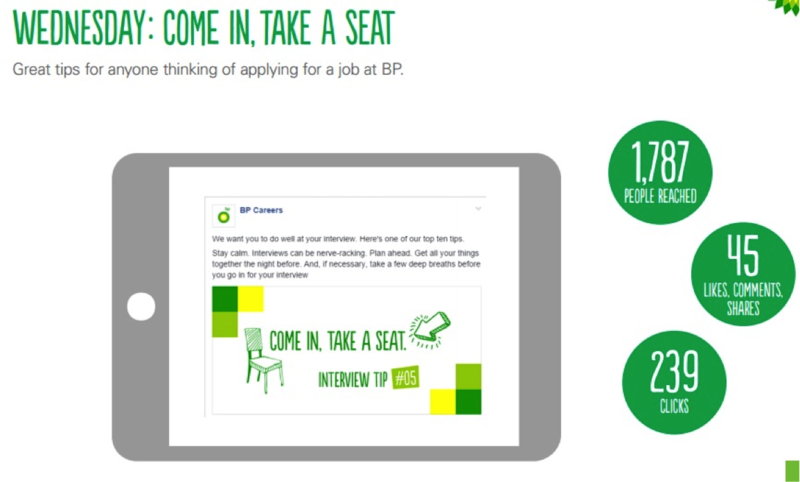 BP created a “weekly playlist,” on Facebook, featuring a different sort of content for each day of the week: Monday highlighted photographs from BP’s locations around the world (where candidates might end up); Tuesday offered multiple-choice questions that tested general knowledge that was relevant to a career at BP; Wednesday provided tips for candidates applying for a job at BP. The content including videos and employees testimonials, and was very fun and shareable. The result was huge engagement every day of the week. I took BP to task for not fully dealing with its 2010 oil spill as an employer, but I can now say the company has recovered and is engaging job-seekers in innovative ways. Accenture’s “Mission Control,” which promoted a 48-hour “experience event, learning opportunity, and assessment center” for students. Accenture started with 10 “Mini Missions,” such as brain teasers, riddles, and satellite image clues that were posted across the company’s social channels. Students gave their solutions through a tweet or a Facebook comment. Then came the “multimedia” part. Accenture created the pieces for a cardboard record player, which gave their engineering audience something tangible to construct. It required the students to set up the device and manually turn the record at the right speed to hear the top-secret message, which was to go to a website. The final phase of the promotion encouraged students to send missions to their friends via social media. The messages included a video of the record player, to show off that aspect of the campaign to as many people as possible. The result was almost 1,000 applications to the Mission Control event, and I’m pleased to say that 58 percent of the applicants to this science and engineering event were female. Seagate’s unique art and copy in “The Dreamer” recruiting initiative shows that recruitment advertising can be beautiful and lyrical, no matter what your organization does or makes or sells. It’s a good lesson for all of us. Tell Powerful Stories To Answer, “Why Should I Join Your Team?”, April 28, 8:30 a.m.
Infuse New Life Into Your Employee Referral Programs, April 29, 11 a.m.